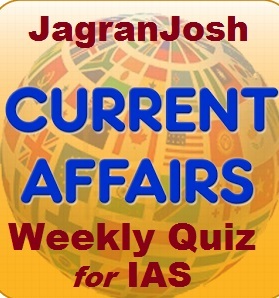 The current affairs quiz is one of the crucial parts of IAS Exam. So, in a view to its important role in IAS Prelims Exam we have provide here the important current affairs quiz based on the important events happened between 20th May 2017 and 26th May 2017. Current affairs should be prepared with a great thrust during IAS Exam preparation. Sincere study of current affairs quiz would be beneficial for both the stages i.e., IAS Prelims and IAS Mains Exam. So, the IAS aspirants should keep practicing more and more number of current affairs quizzes during IAS preparation which will give them immense confidence. Here, we have provided current affairs quizzes based on the important events happened during the week from 20th May 2017 and 26th May 2017. I. GPDRR is a global forum for strategic advice, coordination, partnership development and review of progress in the implementation of the Sendai Framework for Disaster Risk Reduction (SFDRR) 2015-2030 which was adopted in 2015. II. This platform will mark the first opportunity since 2015 that global leaders and stakeholders in disaster risk reduction will meet for the international community to review global progress in the implementation of SFDRR. III. It will also provide a platform for all stakeholders to galvanise their efforts in sustainable development and climate change adaptation, sharing experiences, discussing innovative solutions, and charting out the course for an integrated approach at the international, regional, national and local levels. A high-level Indian delegation is leaving today for participating in the Global Platform for Disaster Risk Reduction (GPDRR) to be held in Cancun, Mexico from May 22-26, 2017. More than 5,000 delegates, including Heads of State, Ministers, CEOs, disaster experts, volunteers, representatives from science and technology sectors and academia are expected to gather in Cancun. GPDRR is a global forum for strategic advice, coordination, partnership development and review of progress in the implementation of the Sendai Framework for Disaster Risk Reduction (SFDRR) 2015-2030 which was adopted at the 3rd UN World Conference on Disaster Risk Reduction held in March 2015 in Sendai, Japan. This will mark the first opportunity since 2015 that global leaders and stakeholders in disaster risk reduction will meet for the international community to review global progress in the implementation of SFDRR. It will also provide a platform for all stakeholders to galvanise their efforts in sustainable development and climate change adaptation, sharing experiences, discussing innovative solutions, and charting out the course for an integrated approach at the international, regional, national and local levels. I. The International Solar Alliance is an initiative jointly launched by the Prime Minister of India and the President of France on 30 November 2015 at Paris. II. Under the ISA, solar rich countries lying fully or partially between the Tropics are invited to share and aggregate data regarding their needs and objectives. Argentina, Burkina-Faso, Chad, France, India, Ivory Coast, Mali, Namibia, Niger, Nigeria, Sénégal, Uganda and Yemen have jointly supported commissioning of a study to define and structure a Common Risk Mitigation Mechanism (CRMM) for solar power generation projects in solar-rich countries recently. This is a major step in the implementation of the Paris Declaration of the International Solar Alliance (ISA) adopted on 30 November 2015 and of the ISA Programme aimed at mobilising “Affordable finance at scale”. This instrument will dramatically lower the cost of finance for renewable energy and the overall price of electricity. The International Solar Alliance is an initiative jointly launched by the Prime Minister of India and the President of France on 30 November 2015 at Paris, in the presence of the Secretary-General of the UN, on the side lines of COP21. Under the ISA, solar rich countries lying fully or partially between the Tropics are invited to share and aggregate data regarding their needs and objectives; emulate successful practices; and set up common mechanisms and instruments, in order to address obstacles to deployment at the scale of solar energy. I. The committee was constituted in July 2016 by the Ministry of Water Resources River Development and Ganga Rejuvenation to prepare guidelines for de-siltation of river Ganga from Bhimgauda (Uttar Pradesh) to Farakka (West Bengal). II. The committee was asked to establish the difference between de-silting and sand mining and also to establish the need for de-silting for ecology and e-flow of the river Ganga. III. The committee in its report says Local factors such as topography, river control structures, soil and water conservation measures, tree cover, and riparian land-use or land disturbance (for example agriculture, mining, etc.) can have a large impact on sediment loads in rivers. Chitale committee on De-siltation of Ganga has recommended a slew of measures which include study of reach wise sediment transport processes along with establishing annual sediment budgets to guide de-silting activities, Preparation of annual reports (Sand registry) describing the previous de-silting/ dredging activity and a technical institute may be entrusted to conduct the sediment budget, morphological and flood routing studies that would examine and confirm the necessity of the de-silting of the reach under consideration. The committee was constituted in July 2016 by the Ministry of Water Resources River Development and Ganga Rejuvenation to prepare guidelines for de-siltation of river Ganga from Bhimgauda (Uttarakhand) to Farakka (West Bengal). The committee in its report says erosion, sediment transport and siltation are very complex phenomena. It is impossible to apply a “one-size-fits-all‟ approach to sediment management and control because the issues involved are frequently very regionally-specific. Local factors such as topography, river control structures, soil and water conservation measures, tree cover, and riparian land-use or land disturbance (for example agriculture, mining, etc.) can have a large impact on sediment loads in rivers. River control structures (such as reservoirs), soil conservation measures and sediment control programmes can cause downstream sediment loads to decrease, while factors such as land disturbance (clearing of vegetation, for example) or agricultural practices can cause increased sediment loads. As per the UNWTO definition, International Tourist Arrivals (ITAs) comprises two components namely Foreign Tourist Arrivals (FTAs) and Arrivals of Non-Resident Nationals. The UNWTO in its barometer ranks countries in terms of their ITAs. So far only the figures of FTAs were compiled in India. However, now India has started compiling the data arrivals of Non-Resident Indians (NRIs), also. Due to this inclusion, India’s improved rank reflecting the true and comparable scenario has now been acknowledged by the UNWTO. As per the latest UNWTO Barometer for March 2017, Rank of India in International Tourist Arrivals in both 2014 and 2015 is 24 as against the previous rank of 41 and 40 in the year 2014 and 2015, respectively. With this inclusion, the share of India in the ITAs has also increased from 0.68% (based on FTAs) to 1.12% in the year 2015. Earlier India’s rank in the Travel & Tourism Competitiveness Index (TTCI), 2017 had also shown 12 places jump from 2015. Rank of India in TTCI Report of 2017 was 40th as compared to 52nd in 2015, 65th in 2013 and 68th in 2011. I. Under new DDUGJY, Government of India provides grant at the rate of 60% of project cost (85% for special category States). II. More than 350 Gram Vidyut Abhiyantas (GVA) deployed in the field to monitor the progress of village electrification works. III. The population criteria have been dispensed with and all Villages/hamlets without any population restriction are eligible under the scheme. Under new DDUGJY, Government of India provides grant at the rate of 60% of project cost (85% for special category States). Further, additional grant at the rate of 15% grant is provided (5% for the Special Category States) on the fulfilment of the prescribed milestones. Under this scheme, the new projects with an outlay of Rs. 42,553.17 Crores have been approved for 32 States/UTs including works of Feeder Separation (Rs 15572.99 Crores), System Strengthening & Connecting Rural Households (Rs 19706.59 Crores), Metering (Rs 3874.48 Crores), Village Electrification (Rs 2792.57 Crores) and Sansad Adarsh Gram Yojana (Rs 398.54 Crores). I. The APA Scheme endeavours to provide certainty to taxpayers in the domain of transfer pricing by specifying the methods of pricing and determining the arm’s length price of international transactions in advance for the maximum of five future years. II. The two APAs signed pertain to chip design/development of embedded software and Information technology (software development) sectors of the economy which has been 4 in the current financial year now. III. The progress of the APA Scheme strengthens the Government’s commitment to foster a non-adversarial tax regime. The Central Board of Direct Taxes (CBDT) has entered into two Unilateral Advance Pricing Agreements (APAs) on 04th May 2017 and 11th May 2017 respectively, with Indian taxpayers. One of the Agreements also has “Rollback” provision. The two APAs signed pertain to chip design/development of embedded software and Information technology (software development) sectors of the economy. The number of APAs signed in the current financial year now is four. The CBDT expects more APAs to be signed in the near future. The progress of the APA Scheme strengthens the Government’s commitment to foster a non-adversarial tax regime. The APA Scheme endeavours to provide certainty to taxpayers in the domain of transfer pricing by specifying the methods of pricing and determining the arm’s length price of international transactions in advance for the maximum of five future years. Further, the taxpayer has the option to roll-back the APA for four preceding years, as a result of which, total nine years of tax certainty is provided. Since its inception, the APA scheme has attracted tremendous interest among Multi-National Enterprises (MNEs). 7. Recently, the scientists of which of the following space organisation have named a new organism discovered by them after the A.P.J. Abdul Kalam? The scientists at NASA have named a new organism discovered by them after A.P.J. Abdul Kalam. Till date, the new organism — a form of bacteria — has been found only on the International Space Station (ISS) and has not been found on earth. Researchers at the Jet Propulsion Laboratory (JPL), the foremost lab of NASA for work on interplanetary travel, discovered the new bacteria on the filters of the International Space Station (ISS) and named it Solibacillus kalamii to honour the late President, who was a renowned aerospace scientist. I. The Hillary Step was a 12-metre-tall rocky outcrop on the south-east ridge of the Alps Mountain in Europe. II. Hillary Step was named after Edmund Hillary who was the first to scale Everest in 1953. Mountaineers confirmed on Sunday that the notorious Hillary Step on Mount Everest has collapsed, possibly during the earthquake in Nepal in 2015. The Hillary Step was a 12-metre-tall rocky outcrop on the south-east ridge of the mountain. The near vertical outcrop is named after Edmund Hillary who was the first to scale Everest in 1953. The Step was considered one of the trickiest parts of climbing the world’s highest peak. It is said that the scaling of the 40-feet rock face pushed Sir Edmund Hillary to the limit. Located at 8,790 metres, the Step is considered by climbers to be the last obstacle before the summit, which is at 8,848 metres. However, a few years earlier, the ascent and descent of the step were made easier with the help of ropes usually fixed by the first ascending team of the season. I. Combustible ice is a frozen mixture of water and concentrated natural gas, technically known as methane hydrate. II. Methane hydrate has been found beneath seafloors and buried inside Arctic permafrost and beneath Antarctic ice. III. The combustible ice can be lit on fire in its frozen state and is believed to comprise one of the world’s most abundant fossil fuels. But experts said on Friday that large-scale production remains many years away and if not done properly could flood the atmosphere with climate-changing greenhouse gases. Combustible ice is a frozen mixture of water and concentrated natural gas. Technically known as methane hydrate, it can be lit on fire in its frozen state and is believed to comprise one of the world’s most abundant fossil fuels. 10. Recently, the National Green Tribunal (NGT) has banned open defecation and dumping of waste on the floodplains of which of the following rivers? The National Green Tribunal (NGT) on Friday banned open defecation and dumping of waste on the floodplains of the Yamuna River and announced an environment compensation of Rs. 5,000 for those violating the diktat. A Bench headed by NGT Chairperson Justice Swatanter Kumar also constituted a committee headed by the Delhi Jal Board CEO to oversee the execution of work pertaining to the cleaning of the river and asked it to submit reports at regular intervals. The green panel noted that almost 67% of the pollution reaching the Yamuna would be treated by the two sewage treatment plants (STP) located at the Delhi Gate and Najafgarh under Phase 1 of the ‘Maili se Nirmal Yamuna Revitalisation Project 2017’. The panel, on May 1, ordered the inspection of the STPs at the Delhi Gate and Okhla Multi-National ensure that wastewater arresting before it reached the Yamuna. It had sought a report with regard to the functioning of these plants. 15. Recently, an Exhibition ‘Return of the three stone Sculptures from Australia to India’ has been organised in the National Capital of India. It was organised to mark the safe return of which of the following stone sculptures from Australia to India? I. The new policy will give a substantial boost to domestic manufacturing and service provision, thereby creating employment. II. It will also stimulate the flow of capital and technology into domestic manufacturing and services. III. The new policy is the reflection of the Government of India to encourage ‘Make in India’ and promote manufacturing and production of goods and services in India with a view to enhancing income and employment. Recently, the Union Cabinet has approved a policy for providing preference to 'Make in India' in government procurements. The new policy will give a substantial boost to domestic manufacturing and service provision, thereby creating employment. It will also stimulate the flow of capital and technology into domestic manufacturing and services. It will also provide a further thrust towards the manufacture of parts, components, sub-components etc. of these items, in line with the vision of 'Make in India'. This MoU shall enable the areas of cooperation such as space science, technology and applications including remote sensing of the earth; satellite communication and satellite-based navigation. 17. The MoU would lead to develop a joint activity in the field of application of space technologies for the benefit of humanity. The Union Cabinet chaired by the Prime Minister Shri Narendra Modi has been apprised of the Memorandum of Understanding (MoU) between India and Bangladesh on cooperation in the peaceful uses of outer space. The MoU was signed in New Delhi in April 2017. This MoU shall enable the areas of cooperation such as space science, technology and applications including remote sensing of the earth; satellite communication and satellite-based navigation; Space science and planetary exploration; use of spacecraft and space systems and ground system; and application of space technology. 18. Recently, the Union Cabinet has approved a Joint Declaration of Intent regarding cooperation in the sector of alternative medicine with which of the following countries? The Union Cabinet has approved the Joint Declaration of Intent (JDI) between Germany and India regarding cooperation in the sector of alternative medicine. The Ministry has taken many initiatives for promotion of Ayurveda in Germany with the recommendation and the cooperation of the Indian Embassy in Berlin. One of the major initiatives is the collaborative research Project between the Central Council for Research in Ayurvedic Sciences (CCRAS) and Charite University, Berlin on Osteoarthritis of the knee. The results of the trial are encouraging and the clinical trial demonstrates significant improvement in patients. The study has been completed successfully and is under publication. 19. 'Adopt a Slum', a new campaign to mark the completion of three years of the Government has started by which of the following ministries of the Government? Ministry of Sports & Youth Affairs has announced “Adopt a Slum” - a new campaign to mark the completion of three years of the Government. The idea is to initiate developmental work in the slums and help the slum-dwellers in resolving various issues. A slum Yuva Daud/Marathon will mark the beginning of this campaign on May 26, 20174 in Delhi. The concerned Ministry along with Nehru Yuva Kendra Sangathan, under the aegis of the Ministry, will initiate “Adopt a Slum” campaign and groups like NSS, public schools, rotary clubs, will pool in with efforts and manpower. I. In the first phase of the scheme of Pandit Deen Dayal Upadhyaya Sanchar Kaushal Vikas Pratisthan Scheme 10,000 people from 10 States/UTs to be trained. II. Uttar Pradesh, Maharashtra, Assam, Goa, Madhya Pradesh, Haryana, Tamil Nadu and Kerala are included in the first phase. III. The Deen Dayal Upadhyaya Telecom Skill Excellence Award will also be given the person who will perform at par excellence. Recently, the Ministry of Communications & Information Technology has launched the BSNL’s satellite phone service that will be offered to government agencies in phase 1 and later opened for others in phased manner. On this occasion, the concerned minister has also launched the Pandit Deen Dayal Upadhyaya Telecom Skill Excellence Award Scheme and Pandit Deen Dayal Upadhyaya Sanchar Kaushal Vikas Pratisthan Scheme. In first phase agencies handling a disaster, state police, railways, Border security forces and other government agencies will be given in the first phase. Later people while travelling on flight and on ships will be able to use it. The services will be provided by INMARSAT which has a constellation of 14 satellites. In the first phase of the scheme of Pandit Deen Dayal Upadhyaya Sanchar Kaushal Vikas Pratisthan Scheme 10,000 people from 10 States/UTs to be trained. Uttar Pradesh, Bihar, Odisha, Punjab and Haryana are included in the first phase.The Department of Telecom to be established more than 1,000 Sanchar Kaushal Vikas Pratisthan in future under the newly launched scheme and Deen Dayal Upadhyaya Telecom Skill Excellence Award will also be given the person who will perform at par excellence. 23. Recently, the news of Anshu Jamsenpa scripting history by becoming the first woman to scale the Mount Everest twice within five days. Who among the following first Indian women to conquer seven Summits of the world? 24. The FRP so approved shall be applicable for purchase of sugarcane from the farmers in the sugar season 2017-18 by the sugar mills.